Nestled right on the beach, the vibrant and exciting St James’s Club Morgan Bay is a haven for everyone. 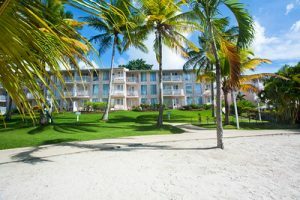 Casual and colourful, this all-inclusive resort sits just minutes from the thriving tourist hub of Rodney Bay, as well as other world-class amenities and the capital of Castries. 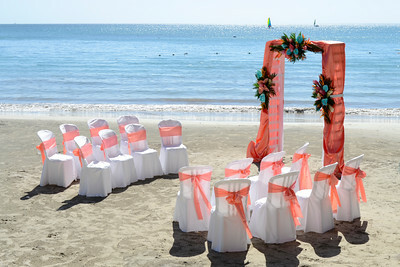 Perfect for couples, families and all sorts of romantic occasions, this hotel really does have it all. Having been transformed several times over the years, it continues to offer its guests outstanding levels of comfort on the west coast of St Lucia, with 22 acres of stunning grounds and a variety of room types all decorated in a lovely and warming Caribbean style. 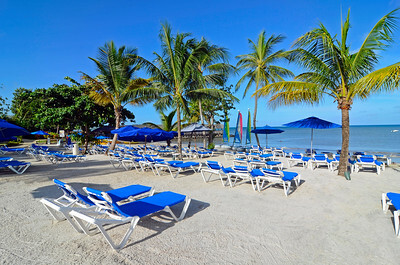 The comprehensive all-inclusive package includes all of your food and drink as well as extensive water and land sports for you to enjoy – not to mention a fantastic kids club. The ideal place to relax and unwind, you can sit back on sunloungers by the new TiKi beach bar and experience service where you sit, or maybe embrace a bit of retail therapy in the wealth of nearby duty-free shops, or even try out a few rounds of golf at the St Lucia Golf & Country Club. 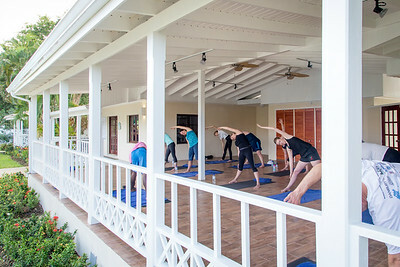 At St James’s Club Morgan Bay you can do everything, or simply do nothing. It’s your holiday in the sun so enjoy it! 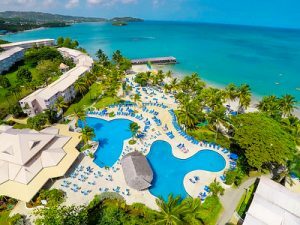 The 345 rooms at St James’s Club Morgan Bay offer a choice of sizes and configurations to suit every need and budget, not to mention some spectacular views out over the rolling hillside, the resort and the sparkling blue sea. Additional guests can be accommodated on rollaway beds (requested in advance). The room amenities as standard include air-conditioning, private bathroom and shower, safe, hairdryer, telephones, tea/coffee making facilities, iron and board, satellite TV and beach towels. There is complimentary internet access available in the lobby and sunset lounge for your use. 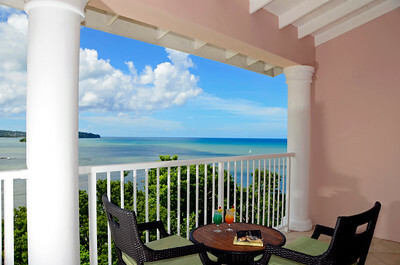 Garden View Room – These rooms feature a lovely Caribbean theme and have a king size bed and a private terrace or balcony with views out over the gardens and the pool. They sleep up to 3 adults or 2 adults and a child. 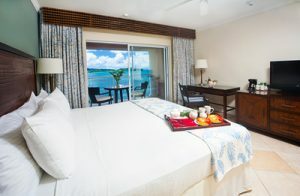 Ocean View Room – Airy and bright, these rooms have a private terrace or balcony with full or partial views of the sparkling blue ocean and a king size bed. They sleep up to 3 adults or 2 adults and a child. 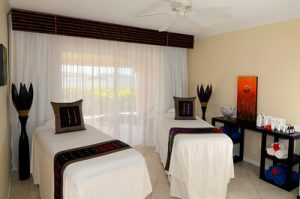 Premium Double Room – Spacious and stylish, these larger rooms feature 2 double beds as well as a private terrace or balcony offering full or partial views of the ocean. They sleep up to 3 adults or 2 adults and 2 children. 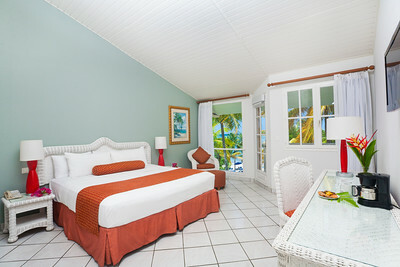 Beachfront Room – Higher up, these large rooms offer a king size bed and are closest to the beach. Naturally the views of the sea are spectacular. They sleep up to 3 adults or 2 adults and a child. Deluxe Ocean View Room – Boasting upgraded furnishings and a stylish decor, these hillside rooms offer lovely views out over the Caribbean and the resort, with the twinkling lights of Castries at night. They have a king size bed and sleep up to 2 adults. One-Bedroom Garden View Suite – These large hillside suites boast a spacious bedroom and dedicated sitting area complete with sofa bed. The bathrooms boast a large bath and shower combo and there is a large terrace or balcony area for you to enjoy lovely views over the gardens. They sleep up to 3 adults or 2 adults and 2 children. One-Bedroom Ocean View Suite – Offering spectacular views out over the ocean, these hillside suites have large bedrooms and adjoining sitting area with sofa bed. 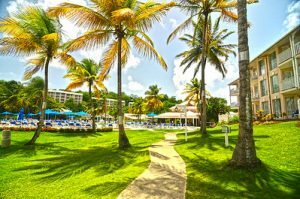 The bathrooms have a large bath and shower combo and there is plenty of space out on the terrace or balcony where you can admire the dramatic coastline, the resort and of course the sparkling Caribbean. They sleep up to 3 adults or 2 adults and 2 children. Family Suites – Comprised of adjacent Garden View Rooms, these suites have interconnecting doors for your convenience. One room has a king size bed while the other has 2 double beds. These are only available on request and sleep up to 4 adults or 2 adults and 3 children. 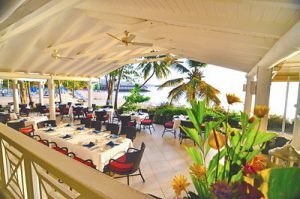 Dining at St James’s Morgan Bay is always a pleasure, and the all-inclusive feature means you have full reign to eat and drink wherever and whatever you wish. There are 6 distinctly different restaurants and lounges to enjoy, each with its own charm and style, and of course menu from which to choose from. 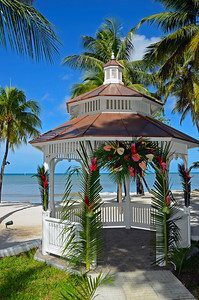 You can have breakfast in a tropical garden, a picnic lunch on the beach before retiring to prepare for a romantic dinner on a pier over the ocean. 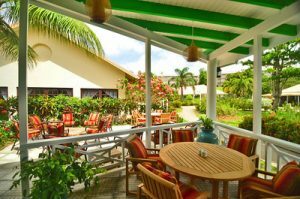 Drinks flow freely during the day and the cuisine on the island is world-renowned, so come and see what all the fuss is about. 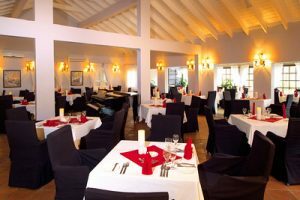 The Palms Restaurant – Classic island architecture and a lovely garden setting combine to give The Palms Restaurant a great atmosphere in which to enjoy delicious buffet style food and international favourites. 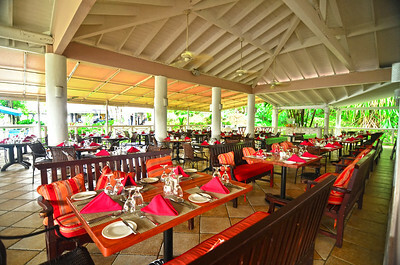 Open daily for breakfast, lunch and dinner with a full bar service. The dress code is casual during the day and smart casual for dinner. 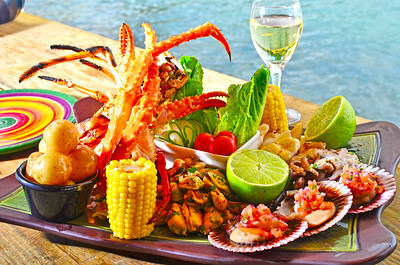 Bambou Restaurant – Dining right on the water’s edge with palms gently swaying and the waves breaking softly, this al fresco restaurant has a modern Caribbean feel to it and is opens daily for breakfast, a light snack menu for lunch and a combination of Asian fusion and contemporary island cuisine. There is a full bar service and afternoon tea daily 3pm – 4pm. The dress code is casual during the day and smart casual for dinner. Morgan’s Pier Restaurant – The epitome of life in the Caribbean, simply step out onto the pier and you are delighted with fresh fish and grilled delicacies with the stunning blue sea as the backdrop while sailboats glide past. Open most evenings for dinner, it is also available for weddings and parties. There is a full bar service and a smart casual dress code. Le Jardin – The fine dining restaurant at St James’s Morgan Bay, there is a definite air of romance as you sit down in air-conditioned comfort to enjoy delicious treats from French Creole to juicy steaks, all complimented with fine wines and ending with elegant desserts. Open for guests aged 12 and over, please note there is a $25 surcharge per person at Le Jardin. Reservations are required and the dress code is smart elegant. 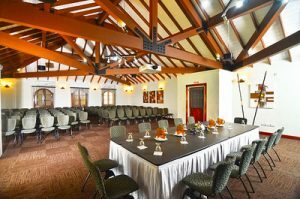 Tree Tops Pizza & Pasta – a new restaurant at the resort, offering made to order pizza and pastas with a twist. A popular treat for the kids and adults alike, it is open nightly from 6:30pm with last orders at 9pm. The dress code is smart casual. 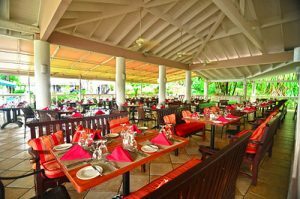 The Plum Tree Bar & Grille – Found as part of the family pool deck, this restaurant served up a variety of lighter dishes, grilled favourites and snacks, all washed down with something cool and refreshing. 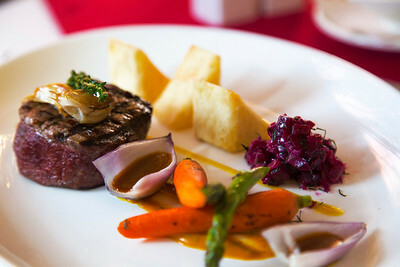 Open daily for lunch until the late afternoon. 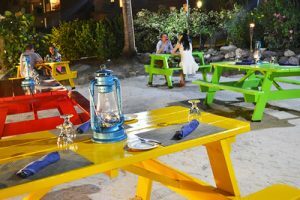 Sunset Bar & Lounge – The centre of all the action at the resort, with a casual atmosphere, activities through the day and live entertainment most evenings. 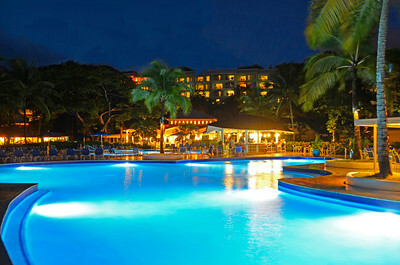 You can get up and dance, mingle with newfound friends or settle in with a romantic cocktail by the pool. Lazy Lagoon Pool Bar – Overlooking the glorious beach and the lagoon-style swimming pools, you can swim up or sit down for a full range of drinks through the day and evening. 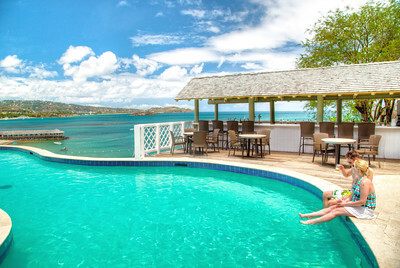 Hilltop Pool Bar – a more romantic respite with panoramic views over the sea, providing the perfect vantage point to enjoy dramatic sunsets. It is open on select days and evenings and is available to hire for private parties. TiKi Bar – This thatched beach bar offers a great place to grab a cool beer while you sunbathe, and offers service at your seat if you just can’t interrupt your sun worshipping regime. St Lucia offers some of the most dramatic and breathtaking environments, and here at St James’s Club Morgan Bay you can take full advantage of everything the island has to offer with a wide range of sports and activities as part of the all-inclusive package. Head to the beach and you can enjoy complimentary water sports including waterskiing, windsurfing , sailing, kayaking, paddle boarding, wakeboarding, snorkelling and banana boating, or back on land and you can take part in tennis, beach volleyball, or working up a bit of a sweat in the resort’s excellent fitness centre where there are fitness classes to take part in. 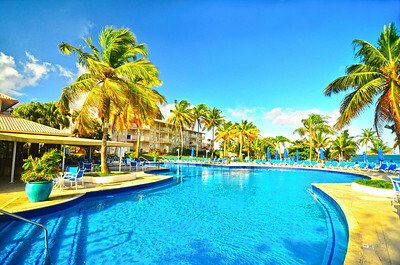 Or of course you can simply relax on the sandy beach or around one of the four free-form swimming pools. 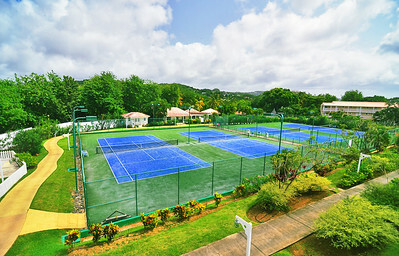 Nearby lies the championship 18-hole course at the St Lucia Golf & Country Club, a great day out for all of the golfers out there (charges apply). Heading out of the resort you are only a short distance from the buzzing capital of Castries, or you can venture out into the throng of Rodney Bay with its huge collection of shops and boutiques, cafes, bars and restaurants. 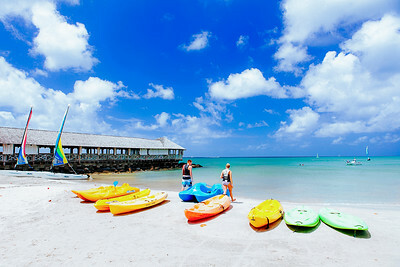 St Lucia is a great island to explore, and there is so much to see and do here. 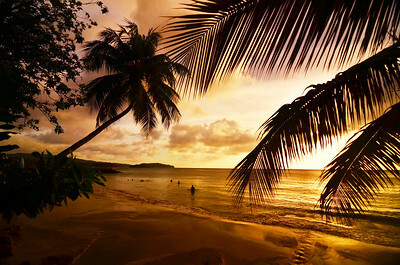 Tours and excursions can easily be arranged, from ziplining through the rainforest to rum sampling at a local factory. Simply pop into reception to ask for more information. 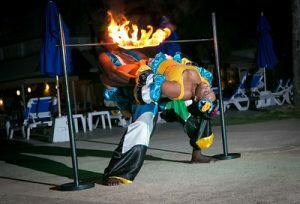 There is also a number of events held throughout the year as well as regular evenings every week in the local area, be sure to check out local markets and speciality evenings for a true taste of Caribbean life. The Spa offers you a respite from the sun and is a great place to relax and feel truly pampered while on holiday. There is a wide range of services on offer, with treatments ranging from massages to wraps to facials and other beautifying things. There is also a salon as part of the spa so you can get that glammed-up look in no time for your romantic evening meal with the one you love. 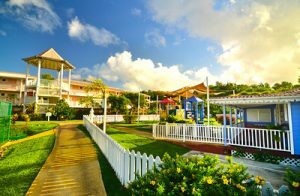 As a family resort, St James’s Morgan Bay caters for children, and its kid’s club is a great place when the little ones want to do their own thing, or you need a little time to yourselves. Suitable for potty-trained kids aged 2 – 11 years old, there is plenty for them to do and best of all it’s all included as part of the all-inclusive plan. 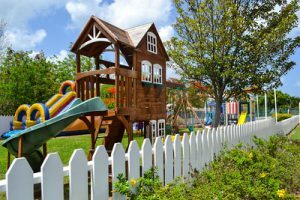 Providing a fun yet education environment, there are playgrounds, kids pools and activity rooms all run and supervised by friendly staff, so you’re safe knowing that the kids are well looked after. Activities run from morning until the evening and include crafts and face painting, volleyball, fun in the pool and sand castle building, dancing, karaoke and parties, dance and cookery classes, movies and more – they won’t want to leave!